A curio cabinet brings the memories of your experiences into your home decor. This Amish Curio Cabinet provides a solid wood cabinet to showcase your display with the charm and beauty of solid wood Amish craftsmanship. 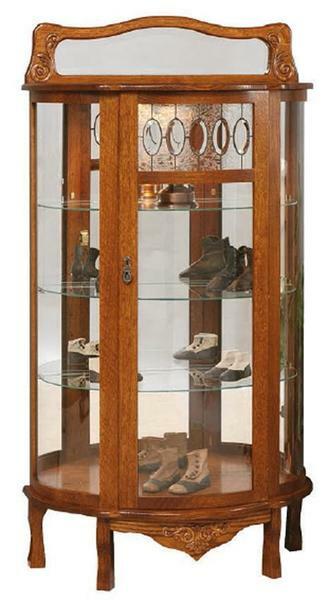 This wood curio cabinet offers three adjustable glass shelves with plate grooves and a mirrored back that adds depth to the design. Touch lighting gently illuminates the display while the craftsmanship that you can rely on to create unique pieces displays a romantic decorative carving at the cabinet base. Amish furniture stands out from the rest as it offers you the option to customize. Put your signature on this Amish curio cabinet by selecting your favorite wood and stain. You choose the hardware and consider adding additional shelves for your precious items. Visit our popular blog, Timber to Table for more on curio cabinet designs and decorating ideas.